by Correspondent, AAHGN. November 12, 2017. Join, or Die is a political cartoon, drawn by Benjamin Franklin and first published in his Pennsylvania Gazette on May 9, 1754 to encourage the former colonies to unite against British rule. Rev. Mesrob Lakissian of St. Illuminator's Armenian Cathedral in New York City. Arevig Caprielian, Lucine Kasbarian, and Rev. Mesrob Lakissian. At the book signing table. The event began with glowing introductions by Rev. Lakissian and Arevig Caprielian, chair of the Hamazkayin Eastern Regional Executive. Then Kasbarian took to the lectern, quickly demonstrating her mastery of the material, both in English and Western Armenian, as well as her passion for this art form in the proverbial toolbox of public persuasion. In tandem with the images projected on the screen, she first described the origins of political cartooning with early examples from Europe and the United States. She outlined the history of cartooning among the Armenians, and showed examples of cartoons that Armenians and non-Armenians have been producing about the Armenian Cause and related subjects. Kasbarian also explained how she herself began creating political cartoons following the murder of Hrant Dink in 2007 and offered examples of her own work, some of which are in her newest book, Perspectives from Exile. Drawing from hundreds of political cartoons in her collection, which she singlehandedly and laboriously researched from an array of sources, Kasbarian spotlighted Armenian artists such as Alexander Saroukhan, Massis Araradian, Krikor Keusseyan, Vrej Kassouny, MediaLab artists and others, including herself. These examples dealt with such topics as Armenia-Diaspora relations, the presidential and parliamentary elections in Armenia, the war in Artsakh, and corruption and domestic violence in Armenia. She also featured the works of non-Armenians such as Khalil Bendib, Arend Van Dam, Carlos Latuff, Kaniwar Zidan and several others, including Kasbarian herself, whose cartoons dealt with the Armenian Genocide, the megalomania of Turkish President Erdogan, Turkey’s support of ISIS and Turkey’s aspirations to join the EU. Kasbarian went on to furnish examples from history of how satirical cartoons mobilized the people to act as agents for positive change. She pointed out that political leaders who abused their power have often persecuted cartoonists precisely because the latter's satirical work was so successful in targeting and exposing these politicians. In addition to her new book, Perspectives from Exile, Kasbarian has produced the award-winning books Armenia: A Rugged Land, an Enduring People and The Greedy Sparrow: an Armenian Tale. She was also a consulting editor and contributor for a special publication called The Armenian-Americans. Kasbarian is a graduate of the NYU Journalism program and studied cartooning at the NY School of Visual Arts. Kasbarian has already presented a modified version of “Armenians and Political Cartoons” to students in the metropolitan New York and Boston areas and is currently planning subsequent presentations in other venues. 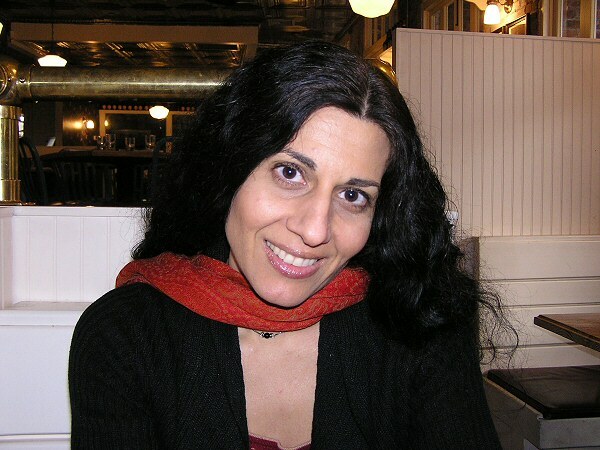 Lucine Kasbarian, writer, political cartoonist and book publicist, has been immersed in book, magazine, newspaper and online publishing for more than 30 years. She is a descendant of survivors of the 1915 Turkish genocide of the Armenians, Assyrians and Greeks, which drove her grandparents from their native lands in Western Armenia (now within the borders of Turkey). Lucine is the author of Armenia: A Rugged Land, an Enduring People (Simon & Schuster) and The Greedy Sparrow: An Armenian Tale (Marshall Cavendish). Her syndicated works, often about the culture of exile, appear in media outlets throughout the world.